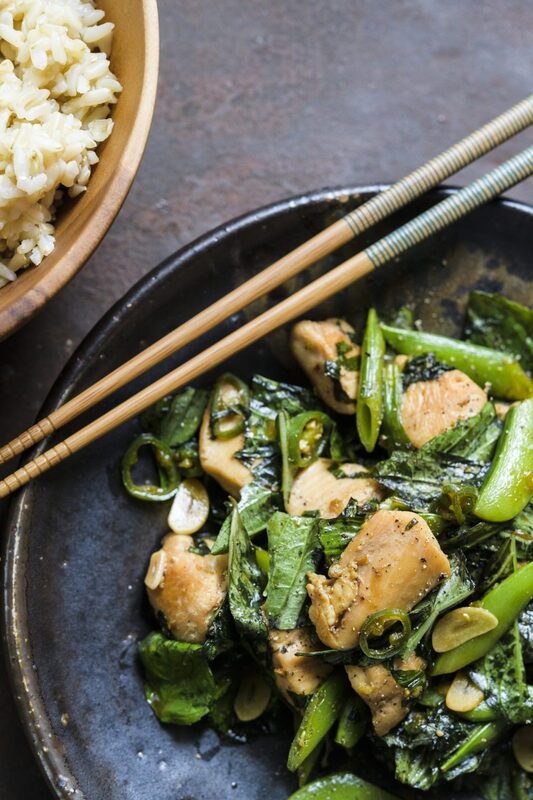 In a medium bowl, stir together the chicken, soy sauce, 1 tablespoon of the fish sauce and ½ teaspoon white pepper. Let sit for 15 minutes, then drain and pat dry with paper towels. In a 12-inch nonstick skillet, heat 1 tablespoon of the oil over medium-high until just smoking. Add the chicken, distributing it in an even layer. Cook, stirring occasionally, until well browned and cooked through, 5 to 7 minutes. Transfer to a clean bowl, then stir in the chopped basil and vinegar. Set aside. Add the remaining 2 tablespoons oil to the skillet and heat over medium-high until just smoking. Add the snap peas, scallion whites and chilies. Cook, stirring occasionally, until the peas are lightly browned, about 3 minutes. Add the garlic and cook, stirring, until fragrant, about 30 seconds. Stir in the sugar. Add the scallion tops and the chicken with the accumulated juices and cook, stirring, until most of the juices have evaporated, about 1 minute. Tip: Don’t begin cooking until all ingredients are prepared. The stir-fry comes together quickly, so make sure everything is ready and close at hand.